So if you haven’t noticed by now, I have suuuuper fine hair, it’s always been the bane of my existence (not to be dramatic). When it came to using a straightener, the idea frightened me. Why in the world would I want my fine, thin hair stick straight?! No. I need all the curls and volume I can get please! And the idea of running something that hot over and over through my hair just screamed “damage”. However I remember reading a long time ago that the number one beauty trick Nicole Richie thought was the most beneficial (or something along those lines) was knowing how to curl her hair with a straightener. So when Irresistible Me reached out with the opportunity to feature their Diamond flat iron on Clothes & Quotes, I decided to step out of my comfort zone and give it a go. 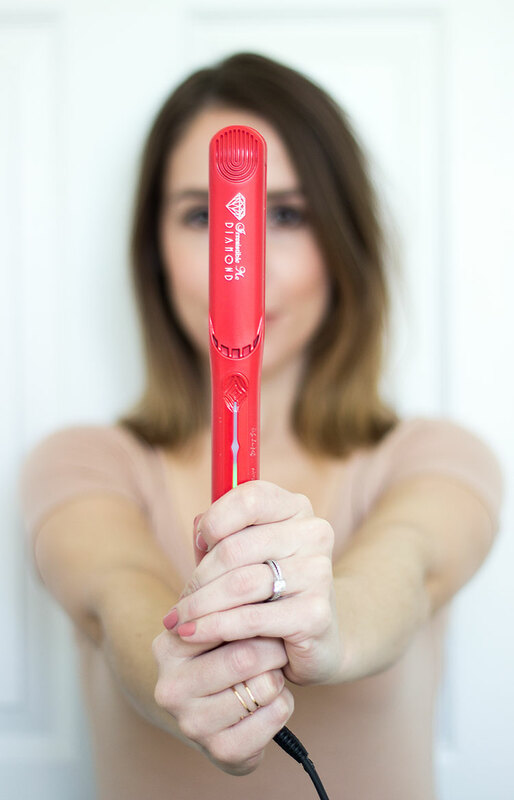 The Diamond flat iron is designed to keep all the natural hair oils and moisture in, which is a big deal when you are using it daily, like I have been. I also love the fact that you can control the temperature of the flat iron, since my hair can’t necessarily handle as much heat as someone with thick hair, it helps to prevent extreme damage which I can really appreciate. I’m not going to lie…it took me a lot of practice. I’m not exactly talented in the hair department, so bear with me, but I think I finally found a curl that not only holds, but also builds some volume in this limp hair of mine. Since I do have fine hair I always like to spray a little texturizing spray in before curling (this product by Unite is seriously a game changer). Continue curling away from your face all around your head. Once all the hair is curled run your fingers through it to loosen everything up. I usually need to run the straightener through the ends and over my bangs because they always seem to be too curly. I need to try this! I have a curling wand, but I feel like it's too much curl sometimes. Straightener curl to the rescue! Oh man, I wish I had heard about this flat iron before I bought my new one! I'm desperately trying to learn how to curl with my straightener, but like you I'm not the greatest at doing my hair (which is also super fine!). The one I use makes OKAY curls, but I'm not sure if it's because I don't know what I'm doing, or because of the actual straightener lo1! This one looks like it does a great job! Your hair looks awesome! Very pretty! Turned out amazing! Will have to try this once my hair gets a little longer! super cute! Love this look on you, Shannon! Irresistible Me has great hair tools, right?! Grow hair grow! haha I have to wait for my perm to grow all the way out before it will do anything. I love loose curls like this! Looks like it took so long to do! Your hair looks adorable like this! I love tools that are multi-purpose like this, thanks for the great tutorial! Adorable!! I use my straightener to curl as well and have actually found it to work well! I completely understand the hair struggles…so I know you're not being dramatic! My hair is so thin and fine that when I pull it back into a pony tail…the total circumference is basically a joke. I'm always trying to make it look thicker! I've actually never tried curling my hair with a straightener, but it looks like yours turned out great! I've been trying to figure out how to do this forever! Thank you! I love this technique for short hair like you have! I just got mine cut into a long bob and this kind of curl makes it look so effortless and easy! I love curling my hair with a straightener! I loved this post because we have similar hair length and that's exactly how I style my hair! Love it! your hair is so beautiful! I swear by the straightener curl! I've honestly never even owner a curling iron because I always use my straightener. It's way easier. Love the irresistible me hair tools. I have the 8 in 1 curler and its a game changer! I love using my straigtener to curl my hair. I think it turns out so nicely. This sounds like a great product, thanks for sharing!! I'll have to try this! 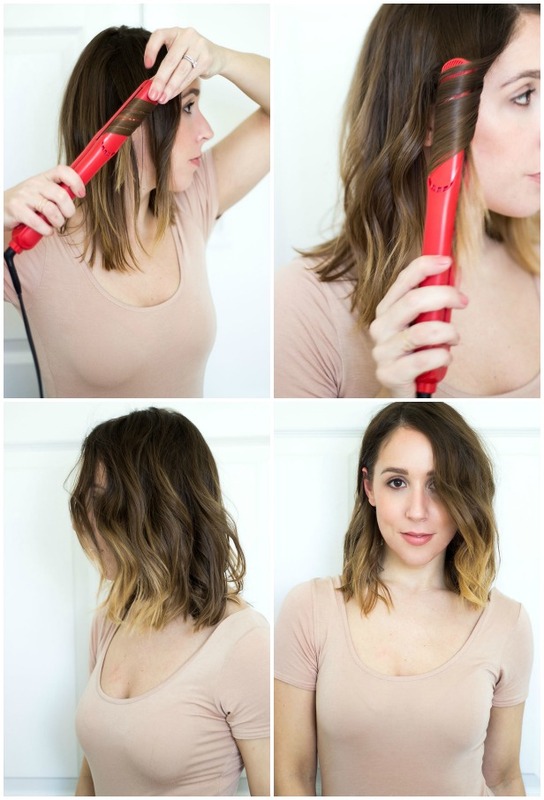 I have a curling wand, but never tried with a straighter… I'm having total hair envy!